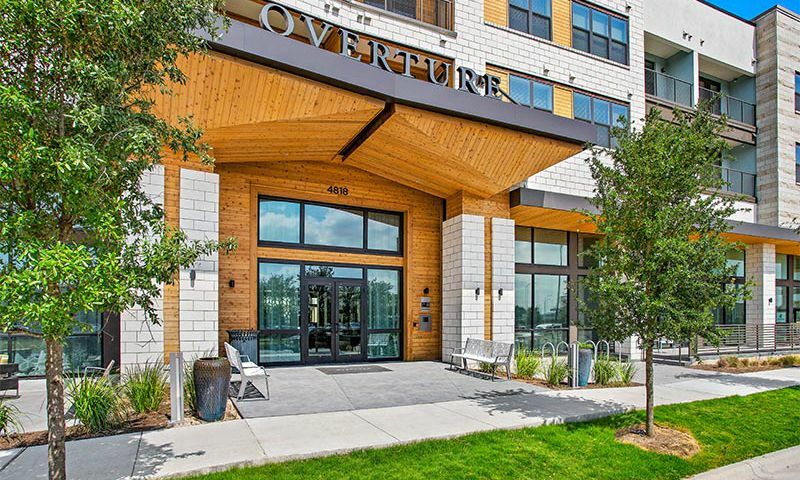 Located in Austin, Texas, Overture Mueller serves as an ideal maintenance-free option that active adults can choose instead of single-family residences. This age-restricted community creates a dynamic environment for 55+ active adults to live a modern lifestyle full of activities and amenities. Whether residents want to lounge by the pool, host gatherings, or take a trip to downtown Austin, Overture Mueller can make it happen. And with a diverse array of restaurants, recreation opportunities, and shops nearby, residents have access to everything they need. Residents of Overture Mueller revel in the fact that they can enjoy so many resort-style amenities from the convenience of an apartment home community. With 12,000 square feet of amenity space, there are amenities, activities, and features for almost everyone to enjoy as often as they want. The community provides two dining options where residents can eat a meal steps from home. The bistro cafe has several quick and easy cuisines, while the large dining area is well-suited for a sit-down meal. The dining area also functions as a meeting space that has enough room for larger community gatherings. Amenities that allow residents to meet and mingle with neighbors include a demonstration kitchen, game room, library, and theater. A business center designates a space for work to be done. The community even features a hair salon and a nail salon for an ultimate convenience. Those who want to exercise can use the fitness center and yoga studio, where regular fitness classes keep residents in shape. Outside, residents have access to a pool, hot tub, and community garden. Residents with furry friends make use of the community's own dog park and dog wash.
Overture Mueller features 201 apartment homes that range between 647 and 1,384 square feet. These one-bedroom and two-bedroom apartment homes feature wood-style plank flooring, large windows, and in-unit heating and air conditioning. Designed with form and function in mind, kitchens have granite countertops, prep islands, glass-tiled backsplashes, espresso cabinets, and stainless steel appliances. Each bedroom features plush carpeting and a ceiling fan while bathrooms feature walk-in tiled showers with spa benches, soaking tubs, granite countertops, and framed mirrors. Other amenities found in each residence include a full-size top load washer and dryer as well as private balconies for added outdoor living space. Residents of Overture Mueller can make use of the community's full social calendar to participate in events and pursue fun activities. Fitness classes include Wii fitness training, water aerobics, Tai Chi, and Zumba. Cooking classes in the demonstration kitchen teach new cuisines, which residents can show off at one of the community's many potluck dinners. Other regular happenings include game nights, movie nights, and holiday parties. Two more social opportunities include crafting events and book club. Overture Mueller even arranges group trips to sports games and local activities so neighbors can explore the area. Residents who love lifelong learning take classes in computers, software, history, and writing in order to pursue new skills and hobbies. Safety seminars, wellness workshops, and nutritional classes also offer great learning opportunities. Residents can even dig into their family history and share interesting stories with neighbors through ancestry research. Overture Mueller is located in the Mueller neighborhood of Austin, Texas close to I-35 and Highway 290. This places the community in a covetable spot surrounded by the area's attractions, restaurants, and stores. Residents can easily drive and use public transportation to get around, but as another convenience, Overture Mueller partners with Lyft to get residents where they need to go. Plus, the Austin location means residents can easily drive to San Antonio or Houston. Many grocery stores and shopping centers are only a short distance away, including Arboretum at Great Hills, The Domain, and Austin Farmers Market. Close proximity to Target, Home Depot, and Mueller Market District makes it easy for residents to shop for whatever they need. The nearby food options include Gloria’s Latin Cuisine, Twisted Root Burger, Wild Salsa, and Zoe’s Kitchen. When it comes to health care, the community is a short drive from five different hospitals and health centers, including Austin Lakes Hospital and Cornerstone Hospital of Austin. Active adults who love to spend time outdoors can visit Bartholomew District Park, dog-friendly Zilker Park, or Mueller Lake Park. Golfers will find plenty of chances to hit the links at Morris Williams Golf Course and Hancock Golf Course. There are plenty of activities available in Overture Mueller. Here is a sample of some of the clubs, activities and classes offered here. Overture Mueller consists of 201 apartment homes that range between 647 and 1,384 square feet. The one-bedroom and two-bedroom residences feature wood-style plank flooring, large windows, and individually controlled heating and air conditioning. Want to learn more about Overture Mueller?